First Timothy presents the most explicit and complete instructions for church leadership and organization in the entire Bible. 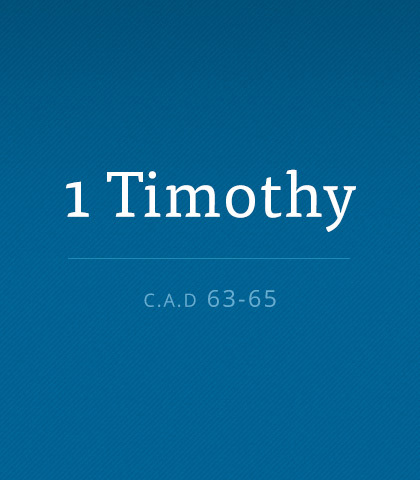 Read more about the book of First Timothy. Over the centuries, tradition has often outshouted biblical principles and caused the church to get off course, which has resulted in every conceivable extreme in teaching and doctrine, including heresy. In this expositional study of 1 Timothy, we return to the source—the Bible—and discover afresh how God planned the church to function. God doesn’t always spell things out in such stark “thou shalt” terms. When we get to the epistle of 1 Timothy, however, we discover virtually a whole chapter devoted to a black-and-white list requiring little interpretation but a lot of application. In 1 Timothy 3:1-7 Paul puts his finger on the essential qualities God is looking for in pastors and elders. Qualities applicable for church leaders in the 21st century as they were in the first century. You can’t escape it: a Christian’s conduct matters…greatly. Christ’s reputation is on the line, and nonbelievers are watching. Is it any wonder then that He decrees that His leaders be above reproach? Not at all. Under the inspiration of the Holy Spirit, Paul continued to set forth in plain, uncomplicated language the non-adjustable, non-alterable essentials of God’s standard for church leadership. You can’t put a price tag on a good name. An honoured and respected reputation is worth more than “silver and gold” (Proverbs 22:1). In fact, we could write in bold letters this very proverb across the last couple of sermons—the one’s dealing with the necessary qualities for the office of overseer or elder (1 Timothy 3:1-7). We could do the same over this sermon because a sterling reputation for those serve as deacons in God’s church is just as essential (3:8-13). We could consider 1 Timothy the handbook on biblical ministry within the church. The first half focuses on the work of ministry—the service. The second half focuses on the workman who performs ministry—the servant. The interlude between these two halves (1 Timothy 3:14-16) focuses on the why of ministry—the soul. Without soul the service the servant performs is sterile. The ministry may be theologically and biblically correct, but it’s all head and no heart. Want a confident family? Focus on building into each other a sense of worth and value. Chuck Swindoll shares one way his family builds into each other when words just aren't enough. Chuck’s grandfather modelled grace during a disastrous driving lesson. His words made a lasting impression on Chuck who has taught about God’s grace for almost 50 years. It’s a good reminder that our words matter.